Are you searching for a book that will teach you to be a teacher? 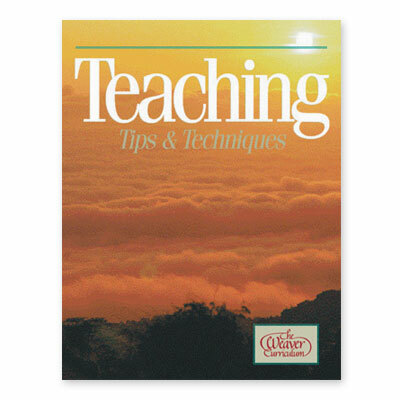 Weaver Teaching Tips & Techniques, from Alpha Omega Publications, is the definitive guide for home educators. What does this book offer? Support and encouragement from a veteran homeschool mother who successfully educated her own three children and authored The Weaver Curriculum®. No doubt about it, this book will give you ideas and suggestions for teaching Bible, science, social studies, and the three Rs. From homeschooling around a baby to celebrating a graduation, this book has information you can use to give your child a complete education. The result? You'll gain valuable tips about homeschooling, such as how to teach specific subjects, when to teach your children together or separately, and what to do when your children's learning styles differ. And that's not all! You'll also learn the ins-and-outs of multi-level teaching, motivating your children, and lesson planning, as well as many other techniques for teaching your children at home. The Weaver Teaching Tips & Techniques is like a teacher training workshop in a book! You'll come back to re-read this book time and time again. Imagine, when your child struggles with motivation, you can read the chapter which deals with that issue. Need ideas for teaching math? It's all in here! Order Weaver Teaching Tips & Techniques today and be encouraged—you can homeschool successfully!